I’m an advocate of prototyping. I’ll even go so far as to recommend that wireframing be reduce to just sketching in favour of prototyping. Still prototyping in a UX environment can sometimes be one of those things that you don’t always get to practice when you would like to. This is where Rosenfeld’s book Prototyping – A Practitioner’s Guide by Todd Zaki Warfel can fill in some of those nagging holes. The first 7 chapters deal with a recommend guide to implementation of prototyping, including paper prototyping. This is well presented concise and worthwhile. As is the last 2 chapters on HTML prototyping and an overview on prototype testing. All these chapters are just what you need for the basics of prototyping, while still offering some extra detail for the experienced UX professional. However there are a number of points within the book that I found just didn’t gel well with me. Now I have nothing against Todd, I’m sure we have a lot of passionate view points in common. It’s just part of this book feels wrong to me. You see in the middle of the book are a series of chapters that discuss how to prototype with various desktop applications. I really would love to know why there is an extra four chapters stuffed into this book reviewing the very basics of using PowerPoint, Visio, Fireworks and Axure Pro as prototyping tools. These chapters are nothing more than a step wise guide to using the applications, a few minor points for prototyping with them. Discussing any software products that aren’t generic is going to be a danger, as it immediately dates the book, considering the book was published in November 2009, it’s already dated. For instance where is MS-SketchFlow, the current UX darling of the hour. Maybe we have a case of the Publisher forcing Todd’s hand on this one, I hope not. It’s as if these extra chapters have been added in to stuff the page count up. You know this makes me wonder if Rosenfeld are really appealing to the UX professional or some other audience I don’t know off. If the first section of the book wasn’t so damn useful I would have give this book a 2 star rating for these filler chapters. If it has been published without these chapters I would rate this book as a must buy (4-4.5 stars), a concise guide to getting started with prototyping. Sadly however for some reason it was published with these filler chapters so the 3 star rating stands. The book starts where it should with a wonderfully presented case for why anyone in the design process should be using prototyping, which can be very easily used on general business as well. I remember reading this chapter with a big smile on my face, you can see that Todd has had to trot out these rebuffs time and time again to the same old anti prototype augments. As expected the book deals with the prototyping process, it does this well, however I felt that this area could have done with a little more detail, nothing major, just a little more of Todds words. One interesting aspect was the presentation of the five types of prototyping and the eight guiding principles, most of which are fairly common sense. However it does help to state them to remind people new and old to the prototyping ways. The chapters on paper and html prototyping could also have been a little longer with a few more examples, on the pitfalls of the methods and ways to overcome them, still they where handy universal references for using prototyping. Finally the book wraps with a discussion on prototype testing. Now this is not your usual user testing chapter. Sure it does talk about user testing for 8 odd pages, but the real gold here is in the list of common mistakes and ways to overcome them. This type of practice advice is invaluable to any UX professional. Worthy of the UX Library or Not. If any of you don’t know, by now, I hate fill in a book, with this book it was a chore read those middle chapters. In a way they spoilt a damn good reference book. 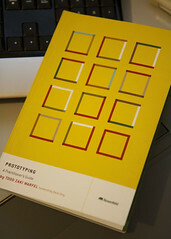 Now if you don’t have a prototyping guide, yes go out and buy this book. You can always skip those deadwood chapters, they add nothing to the book and you will not miss them. However if you already have a prototyping reference, I would consider against buying this book, unless you really want it.